Dec 2, 2015, by Misael León. Leah is a Design Researcher. Her unique way of customizing different research methods in a very flexible way impressed us. We had the opportunity to talk to her about this and other topics. Here’s the first part of our conversation. 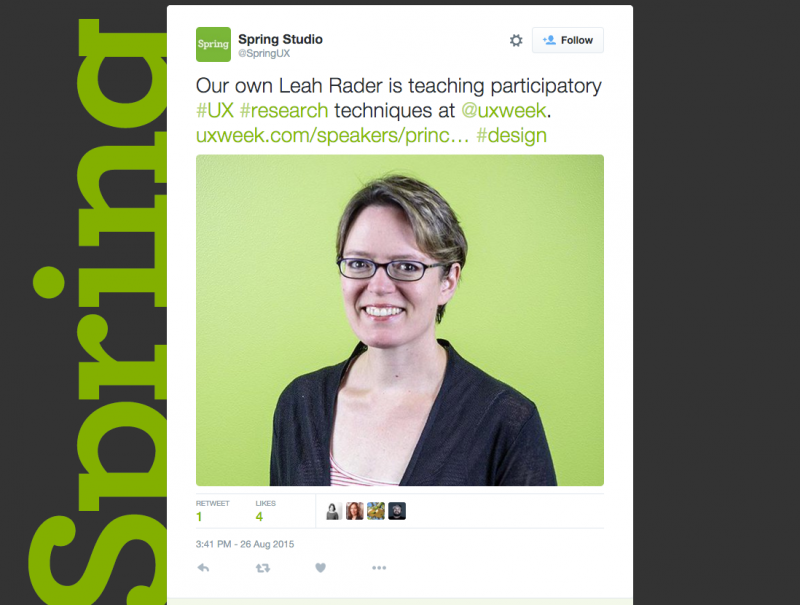 Leah is Principal Researcher at Spring Studio, a seasoned design studio in San Francisco, California. She conducts participatory research to explore problems or given situations related to lifestyle, consumption habits, or attitudes toward the products and services of the Firm’s clients. Using a qualitative approach, she gains a deep understanding of the motifs and unspoken feelings of users. Then, at a later stage, she informs the design process with her findings. How Did You Get into Design Research? Yes, I’m really lucky because I’ve been able to do design research since 1997 or ’98. Basically I apprenticed. My degree from college was in communications. My boyfriend had a roommate who told me that I would be a good fit for the company he was working at. I joined a small research and design agency in Chicago at that time. And it was like a magical experience because I had all of these really kind hearted loving anthropologists and sociologists from the University of Chicago. And then these design experts from IIT which is a really great design school in Chicago. And they heavily hired people from those schools. We need to be safe. We need to feel understood. We need to feel stable. So they taught me how to do ethnographic research. And that was my foundational learning. That was my “University” experience except in an applied context. Talking about Ethnographic Research, What Challenges Have You Encounter Surrounding Cultural Differences? I’m actually in the middle of this. The agency I work for was acquired by a global bank headquartered in Madrid. So now I’m starting to have these opportunities to do research and to understand how people manage their financial lives in lots of countries. In this process I keep asking myself what are all of my biases? What are all of my assumptions about how people think? What they think about money? It’s extremely different in different countries. One thing I learned recently is that when you receive a paycheck in a lot of South American countries, you automatically have a bank account because that’s part of the way it’s managed there. And that doesn’t exist in the United States. But the thing that’s interesting is that there are a lot of core concepts when it comes to people, like what makes us human and what we need. We need to be safe. We need to feel understood. We need to feel stable. Those things are the same everywhere but it’s how they get expressed that varies. Like, what that looks like in each different culture. With these Cultural Differences in Mind, How Do You Define the Scope of Your Research? We’re looking at multiple cultures at the same time. So we aren’t going to base product decisions or platform decisions on what’s happening in one country. So that’s why we are going to do research and design efforts that are incorporating multiple country needs and points of view at the same time instead of doing it in one place and sending out. How Do You Backup Your Research Decisions When Faced with Stakeholders? If they push back on a decision, it means they don’t see those people’s response as rational and logical. They don’t have empathy with those participants, yet. It’s too in conflict with their own point of view. Stop it. Don’t talk about methods. How Do You Convince People that Research and Planning Are Worth It? This can be a big educational task. They need to know there are different ways to do research. A little is better than none. We can be very agile. We can be very informal, guerrilla style. Low budget, not fancy. But still get awesome information to help us think. You are always going to have to use the fact that they trust you. You are selling this and it is your reputation and it is your expertise. No one else is going to do it for you. You have to be, like, I need you to take a chance on me. Hey Stakeholder, I need you to work with me on this because this could be the breakthrough for your product, the one you care so much about. And I’m here to tell you this is going to help you, it’s going to make a difference. But you’ve got to let me in on your planning cycle. The lesson I learned was you cannot expect people to build research into their process unless they have a personal commitment to you as a designer or a researcher. Because if it’s not baked into the cultural process, they will forget. They can’t help it! So Research Can Only Be Sold to Convinced Parties? What is the Best Way to Sell the Value of Research? In part two we continue the conversation with Leah and review the challenges of interpreting data and turning them into UX solutions. Written by Misael León, on Dec 2, 2015, in Design, Interviewing, UX.